In a surprise move, HBC has announced it will end management of FiberNet Monticello, though the actual time frame has not been announced. FiberNet Monticello is a FTTH network approximately 45 miles northwest of Minneapolis. HBC has been operating the publicly owned network, offering triple play services, since inception. FiberNet Monticello has had a particularly rough road since citizens overwhelmingly voted to build it to create a locally owned alternative to cableco Charter and incumbent telco TDS. TDS landed the first blow against the network with a frivolous lawsuit. Though the courts tossed it out, the proceedings took a year and slightly added to the interest rate Monticello had to pay on its debt. Since then, TDS invested in its own FTTH connections and Charter engaged in a vicious bout of predatory pricing in their attempt to drive competition out of Monticello. Throughout it all, the City and HBC worked together to deliver the best broadband and customer service in the area. However, the network has not met its revenue targets (largely due to time lost from the lawsuit) and that has led to discussions about how to ensure the network would become financially self-sufficient as rapidly as possible. HBC's performance in Monticello has actually been impressive given the anti-competitive tactics of Charter and TDS. 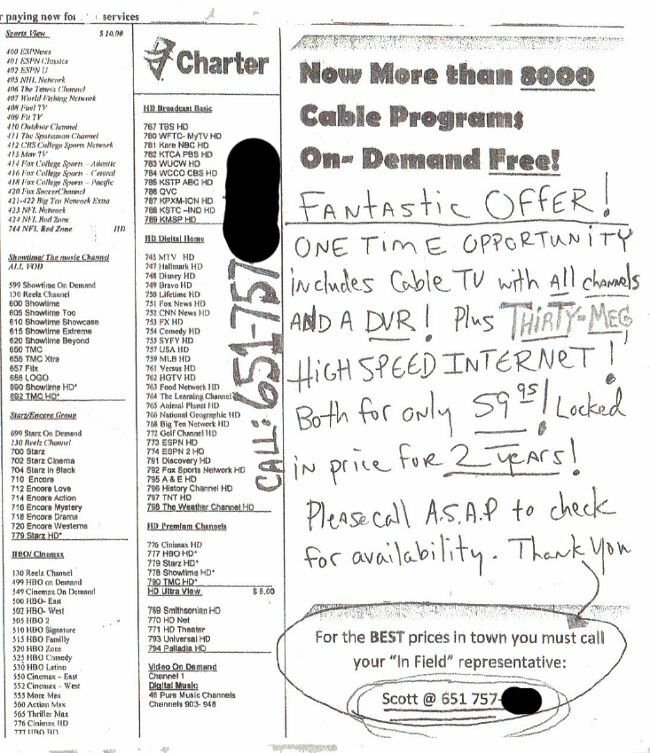 If you want to know why we have no cable or broadband competition in America, look no further than the refusal of state and federal agencies to investigate predatory pricing tactics used to deny subscribers to FiberNet Monticello. When a tornado rips your town apart and destroys your home, should you have to pay extra fees to your cable provider? Of course not. But we continue to see these news stories about massive cable companies ripping off people who are just trying to find the energy to get by day to day. Last year, we saw reports about Charter Cable telling Alabama tornado victims they had to "find" their cable boxes or pay for them. Fortunately, when Spain followed up with Charter after receiving another bill, the representative told him not to worry about it, suggesting that either Charter has an ambiguous policy to deal with it or Spain found a customer support person who's heart had not yet been crushed by soul-numbing job of being a customer support representative for a massive cable company. Fascinatingly, an article in Michigan claims Comcast does not have a policy in place for these situations. Following recent tornados in Michigan, Comcast customers who lost their homes were given the option of paying a cancellation fee or paying a reduced "vacation" rate for a service they could not use. Katherine Pfeiffer and Kathy Crawford soon found that residents were being told that they would be responsible for damaged or lost cable boxes and modems. Initially residents were told their accounts with Comcast would be put on “vacation” status, where a monthly fee of between $15 and $20 would be charged. Comcast is supposedly "working on a solution" for these people. We are hearing that SB 313 in Georgia, AT&T's bill to overrule local authority, will be turned into a study bill. Despite the strong support of the Senate Majority Leader, the bill lost support after we and others exposed the frank admission of AT&T's CEO that they had no plans to expand broadband in rural areas. Given the strength of AT&T's lobbying and the support of the Senate Majority Leader, this is a tremendous victory. Congratulations to the communities in Georgia that successfully organized and defended their authority to decide locally if a network is a wise choice for them. We do not consider these issues resolved until the ink is dried, but it does look like AT&T lost this round -- which means thousands of local businesses and millions of people won. They can still hope for next-generation networks and a real choice in providers. Note: the South Carolina bill remains in play and will be discussed on Wednesday by a Senate Judiciary Subcommittee. We have been collecting some of the news coverage of this broadband debate in Georgia, but have neglected posting until now. Here is a run-down of some of the coverage. Leaders from cities including Elberton, Hogansville, Thomasville, Monroe and Toccoa lined up to tell senators that broadband is necessary infrastructure for the 21st century economic development they hope to attract — and that they are doing what they must to keep their communities competitive. "We cannot wait for the private sector to ride to our rescue," said Tim Martin, executive director of the Toccoa-Stephens County Development Authority. Thomasville Mayor Max Beverly said the city's broadband network supports major employers there. The Chelan Public Utility District in Washington state is upgrading network capacity as it starts expanding the network following its broadband stimulus award. We previously covered their consideration of whether to expand from passing 80% of the territory to 98%. Chelan is one of the most rural publicly owned fiber networks as well as one of the oldest ones. In a rarity, it looks likely to run in the red permanently (the pains of rural, mountain terrain) with the support of most ratepayers. These ratepayers recognize the many benefits of having the network outweigh its inability to entirely pay for itself. The utility also runs a sewer project that is subsidized by wholesale electricity sales. Though some areas in Chelan are served by Charter and Frontier, the more remote folks would have no broadband access if not for the PUD. With the planned upgrades in 2011, Chelan's open access services will offer far faster speeds than available from the cable and DSL providers. Under Washington law, the PUDs cannot sell telecommunications services directly to customer. The PUD builds the network infrastructure and allows independent service providers to lease access while competing with each other for subscribers. Though this is a great approach for creating a competitive broadband market, it has proved difficult to finance (if one believes this essential infrastructure should not be subsidized as roads are). Sixty-four percent of 450 randomly chosen Chelan County registered voters who were part of phone survey in August said they favor taking the grant and completing the buildout, even if it means their electric bills will go up by as much as 3 percent — about $1.50 more on a $50 per month power bill. On November 9, PUD Commissioners approved the rate increase. OptiLink, the community fiber network in Dalton, Georgia, has been chosen by local newspaper readers as the Best Internet Provider in 2010 - the third year in a row. According to Stop the Cap!, the community network has a take-rate of 70% and generates $1.5 million in revenue monthly - real money that stays in the community rather than being distributed to Charter shareholders. Learn more about OptiLink here. Despite a coordinated campaign by cable incumbent Charter that offered little honest debate or accurate claims, the citizens of Opelika voted yes on their referendum to allow the city to build a broadband network. The City's public power utility will use the network for smart-grid services and a private company will likely contract to deliver triple-play services. One gets the sense that the Mayor took some umbrage at Charter's tactics to prevent the community from building its own network. The day before the election, Stop the Cap! ran a fantastic article about Charter's manufactured opposition to the community network. Phillip Dampier investigated the background and claims of prominent opponents, including Jack Mazzola, who might as well have written some of the articles in the local paper about the Smart-Grid project for how often he was quoted by the reporter (who often failed to offer a countering view from anyone in support of the network). Jack Mazzola claims to be a member of Concerned Citizens of Opelika and has become a de facto spokesman in the local press. He claims he is “30 years old and have been a resident of Opelika for almost two years.” During that time, he evidently forgot to update his active Facebook page, which lists his current city of residence as Atlanta, Georgia. Suspicious readers of the local newspaper did some research of their own and claim Mr. Mazzola has no history of real estate or motor vehicle taxes paid to Lee County, which includes Opelika. Any community considering a referendum on this issue should read this Stop the Cap! post and learn from it because massive cable companies like Charter all use the same tactics in community after community. When communities do not have a response ready, they can suffer at the polls. 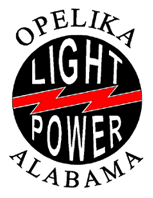 Opelika, Alabama, is home of some 27,000 people and a public power utility called Opelika Power and Light. On Tuesday, Aug 10, the city will hold a special referendum to decide if the community can build a network that will cover telecommunications and smart-grid services. Alabama is one of the states that preempt local authority to build broadband infrastructure, requiring a referendum and imposing limitations on the business plan for community-owned networks that it does not do for privately owned networks. The local newspaper has a Q&A to answer questions about the project. Expected cost is in the neighborhood of $33 million and will be funded with revenue bonds if citizens approve the project. Opelika Power and Light already has a fiber ring that will be used in the project if they move forward (the project could start offering services as early as Fall 2012). From a distance, it appears that details are not yet worked out (and why would they be -- until they have the authority conferred by a successful referendum, they would not complete any agreements), but the private company Knology will likely provide some of the services on the network built by Opelika. The local editorial board endorsed the plan. That’s what the ballot will read in Opelika on Aug. 10. And the answer: absolutely yes. The homeowners have discussed the problem with Charter Communications Director of Government Relations Nick Pavlis three times. He said the company spends $500 per house as a general rule, which gives them a 36-48 month return on investment. Yet Charter has no problem lobbying the states to prohibit publicly owned networks. Tennessee probably has more fiber-to-the-home initiatives than any other state - perhaps it is time Cleveland looked into their own or cajoling a nearby network into expanding.